Zainab Ghadiyali’s path to tech has been anything but conventional. While her recent resume is impressive — spanning a rise up the engineering ranks at Facebook, her current role as a Product Lead at Airbnb, and a side hustle as the co-founder of Wogrammer — the inclines and contours of her unlikely path to Silicon Valley are far more remarkable, delineating the cartography of an extraordinary career. Her journey has been formed by striking transitions: At the age of 19, with $107 in her pocket, Ghadiyali left her hometown of Mumbai to study chemistry at a small college in South Carolina. During her time as a student, she assisted with research on Chinese acupuncture and alternative medicine in Berlin. Next, her work with a public health nonprofit took her to some of the remotest parts of Peru and Nicaragua, before a fortuitous turn of events led her to an engineering interview at Facebook. “I didn’t even know Silicon Valley existed until I was 25,” she says. “Across all of my life experiences, I was just hungry to learn.” Rather than taking a prescribed professional direction, Ghadiyali followed the call of her curiosity. It’s an ethos that, to this day, helps her to maximize her personal growth and carve out an unconventional career. In this exclusive interview, Ghadiyali chronicles the transitions that have shaped her unique professional course, identifying the key skills needed to excel in any role. She offers advice on how to grow your career in every direction, shares the questions to ask yourself at every juncture, and gets tactical on how to surround yourself with supporters. From pushing past impostor syndrome to powering up a side hustle, her insights — and colorful, circuitous story — have illuminating takeaways for entrepreneurs at any stage of their career. All told, Ghadiyali’s journey serves to prove that the curiosity-driven career might be the most rewarding path of all. Here’s how you can forge your own. When Ghadiyali was growing up, the tech industry seemed worlds away. “I grew up in a middle-class family in India,” she says. “My parents didn’t graduate from college, so they were very supportive of my education.” Deep in the stacks of Mumbai’s libraries, Ghadiyali pored over autobiographies, captivated by the lives of luminaries whose experiences were so removed from her immediate surroundings. Between those pages, Ghadiyali discovered the guiding principle that would drive her course for the rest of her life: curiosity. “Books instilled the desire to learn about worlds that were very different from mine,” she says. Leverage a creative — not reactive — mindset to overcome uncertainty. To push past the temptation to give in to apprehension, she draws from a framework inspired by Bob Anderson’s work on The Leadership Circle, that has helped her to differentiate between two distinct ways of thinking about uncertainty: the creative mindset and the reactive mindset. As you set out in your career, let curiosity be your guide. You'll never know where it might lead you, but that's the thrill — it empowers you to explore possibilities beyond what you could have imagined. Picture your career as a painting, not a ladder. Ghadiyali found she was in better position to embrace her inquisitive impulses the moment she let go of the notion of a “career ladder.” This traditional concept implies that a career should be thought of as linear, a neat progression along a narrow track. But that metaphor leads to a rather limiting focus on upward growth. In reality, opportunities abound in every direction. For instance, when she began her career, Ghadiyali didn’t have the luxury of following a straightforward career path. She had studied alternative medicine in Berlin during college and considered becoming a doctor, but winced at the cost of med school. She also graduated in 2009, in the thick of the recession, which limited her options even further. “I applied to over 200 jobs online and got rejected everywhere,” she says. Without a clear next rung to place her foot on, Ghadiyali set off in different directions to hone in on her interest in healthcare in another way. She left the U.S. to work for the public health nonprofit the Foundation for International Medical Relief of Children, which took her to far-flung villages in India and South America. After close to a year, she decided to go back to the U.S. for grad school, to study health economics. On paper, Ghadiyali’s moves might seem like a series of missteps leading her astray from her eventual path to tech. But by drawing excitement and curiosity as a throughline, the connections between apparently erratic transitions begin to emerge. That’s why Ghadiyali encourages people to instead think of their careers as a work of art. When we visualize a career ladder, we start putting ourselves in a box. Step back and see the painting — every experience adds a brushstroke to a bigger picture. Ask these questions to unlock omnidirectional growth. The decision to ditch the career ladder opens up the possibility of pursuing other, more expansive areas of growth that are conventionally overlooked. More importantly, it gives you the freedom to define success and growth on your own terms. Careers aren’t just about rocketing upward. Expanding horizontally gives you a stronger foundation to pursue vertical growth. Once at grad school, Ghadiyali began to reconsider her professional goals. “It occurred to me that while I loved learning about the subject, I didn’t feel excited about pursuing a career in health economics. I needed a change of direction,” she says. This rigorous, guided reflection enabled Ghadiyali to determine her next play after grad school. “I recalled a question that had fascinated me in the past. When I was I working on the ground in the nonprofit sector, I saw the importance of communities in public health firsthand — specifically online social networks and the powerful impact they had on disseminating health information or connecting individuals in underserved regions. I thought, ‘How can we use a social network to advance healthcare and public health, at the largest scale?’” she says. “That’s when I first realized I could make my impact in tech, the industry where these platforms were being created,” she says. At first glance, “follow your curiosity” may seem like bumper sticker career advice. But Ghadiyali turns a vague truism into a tactical tenet by emphasizing the importance of follow-through. “You need to pay attention to your interests and then, more critically, zero in on how to translate that into meaningful work, into a role you can pursue,” she says. “When the idea struck to work in tech, I had no connection to that world and seemingly lacked any relevant skills. But I was determined to make it happen, one way or another,” she says. For Ghadiyali, translating an interest into a role or a career requires carefully spotting opportunities — and then taking advantage of them. In her case, the key that unlocked the door to the tech world was free Chinese food. “One evening in grad school, I stopped by an event that advertised free Chinese food. For a student living off of pizza, it seemed too good to pass up,” she says. The event turned out to be a hackathon sponsored by Facebook, and just before she could sneak away with a full plate, a Facebook recruiter approached Ghadiyali and asked which team she was on. There was just one caveat: It was an engineering interview. While it was an open door to connecting the public health work that she loved with the power of a social network, Ghadiyali hesitated. “I thought, ‘I should wait six months, learn to code, and reach out again to reschedule.’ When you’re presented with an opportunity, it’s tempting to give into those doubts, to make excuses like ‘The timing isn’t right’ or ‘I’m not ready for this,” she says. The reality is that no one is 100% prepared for a job. In the end, what differentiates the star players is whether they can spot an opportunity and show up for it. “It reminded me of this saying that a family friend and mentor once shared with me: When the train is leaving the station, you need to jump on it,” she says. With the realization that there might not be another car coming along, she accepted the interview. While Ghadiyali’s fluke interview with Facebook could have remained a funny anecdote about a hackathon and free food, her willingness to seize the opportunity made it her launch pad into tech. After she was offered the engineering internship, Ghadiyali entered Facebook eager to learn. But she quickly discovered that while it’s admirable to take a leap of faith, executing on the follow-through is the true challenge. Frustrated and fighting back tears, she told her manager that she wanted to give up. To her surprise, he stopped her. “He told me to stop worrying about my deficiencies and comparing myself to others with more experience. His support and that reality check really meant a lot to me,” she says. After that conversation with her manager, Ghadiyali got to work. “I spent the remaining weeks of my internship cramming in as much coding as I possibly could. I was even sleeping at the office.” By the end of the internship, she not only completed her project, but also earned a full-time position as a production engineer. For intrepid pioneers of the unconventional path, there aren’t always pre-existing targets or institutional guideposts to support you along the way. Develop the power to persuade — it’s the skill that keeps giving. 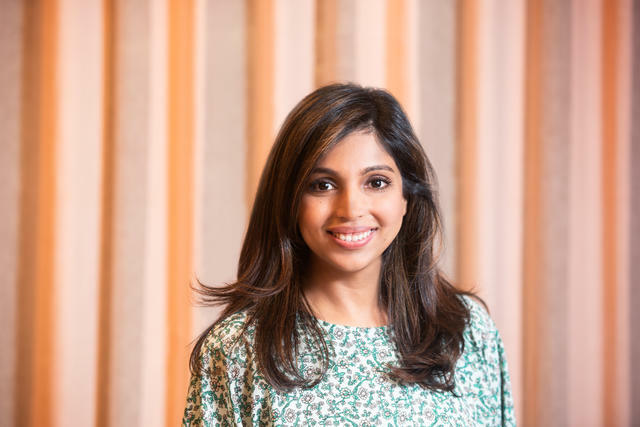 Since she’s moved from engineering at Facebook to product lead at Airbnb, Ghadiyali has noticed another unexpected benefit of the meandering career: the wealth of transferable soft skills she had acquired over time. We think of influence as a superpower. But the truth is, everyone is an influencer. You convinced your parents to let you see that movie. You talked the flight attendant into upgrading your seat. Influence is a life skill — and we should all exercise it more deliberately at work. Hire for hunger, not a checklist of qualifications. Now that she’s a hiring manager herself, Ghadiyali has gained new insights from sitting on the other side of the table. She’s hired close to a dozen employees in her career, and with every process she’s run, she’s advocated for looking at a candidate’s skills more holistically. In Silicon Valley, we tend to over-index on a rigid list of qualifications, when in reality, softer skills have far more impact than a sequence of specific titles on a resume. What do you geek out about? Ghadiyali picked up this tactic from Kristen Hamilton, CEO of Koru. “Does a candidate exhibit hunger in their personal lives? I look for people who work on side projects. It could be baking, fishing, building apps — anything that shows a zest for learning in your free time,” she says. 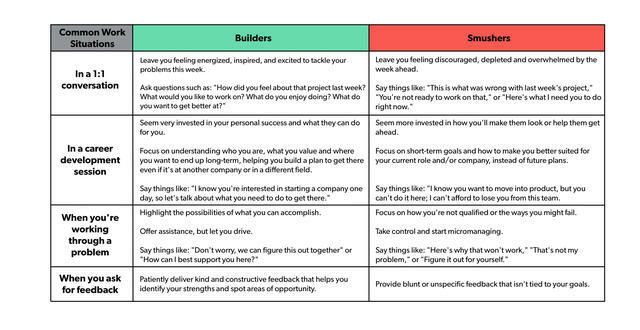 To identify the builders in your own life, Ghadiyali recommends paying attention to your emotions. “Who leaves you feeling inspired or excited about solving a problem after a conversation? That’s the mark of a builder. They’re invested in your growth,” says Ghadiyali. For when you inevitably encounter a smusher in your career, Ghadiyali says, “Don’t let the initial shock derail you. Over time, I’ve learned to ignore the naysayers and stay focused on the next step I can take to achieve my own goals,” she says. Sometimes passion and curiosity can’t be satiated with company moves and new titles alone, which is when the side project is born. Ghadiyali felt this itch four years ago, when she was a software engineer at Facebook, and she first began to question the narrative around being a woman in tech. To remedy this disparity, they launched Wogrammer as a part-time Instagram project in 2014. Since then, the platform has flourished and found new ways to further its mission. Wogrammer now publishes profiles of women in technical roles, hosts workshops and runs a fellowship program for journalism students who will shape the next generation of narratives about women in tech. You don’t ask a man what it’s like to be a male product lead, so don’t ask a woman what it’s like to be a female product lead. Ask her about her accomplishments, what she’s building now, or what she thinks the future will look like — those are far more interesting questions. Regardless of the passion you’re pursuing, balancing a side hustle with the responsibilities of a full-time role isn’t an easy feat. When you only have a couple hours in a day to work on a passion project, you have to be methodical about maximizing your time to yield the greatest impact. Looking backward, Ghadiyali has amassed a constellation illuminated by curiosity. By centering personal learning and seizing opportunities to grow in diverse directions, anyone can apply her takeaways to design a career that’s unique — and most of all, meaningful — to them. To the young grad just starting out, here’s what I’d say: Don’t worry too much about building a resume. Focus on building your repertoire of skills, and most of all, on creating a really great life. But perhaps personal happiness and fulfillment aren’t the only benefits of taking the career path less traveled. As Ghadiyali notes, if you design your professional transitions around inquisitiveness, adaptability, and investing in a diverse set of skills, you can effectively future-proof your career.